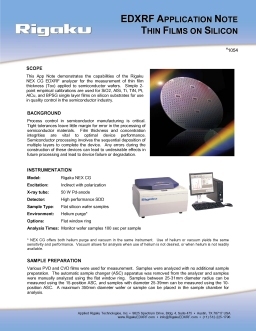 EDXRF | XRF for Semiconductors & Magnetic Media - Applied Rigaku Technologies, Inc.
Semiconductor device fabrication is the process used to create the integrated circuits (silicon chips) that are present in everyday electrical and electronic devices. It is a multiple-step sequence of photographic and chemical processing steps during which electronic circuits are gradually created on a wafer made of pure semiconducting material. Silicon is the most commonly used semiconductor material today, along with various compound semiconductors. The entire manufacturing process, from start to packaged chips ready for shipment, takes six to eight weeks and is performed in highly specialized facilitiy known as a FAB. Magnetic memory is an engineering term referring to the storage of computer, audio or video data and is a form of non-volatile memory. Information is typically accessed using one or more read/write heads. 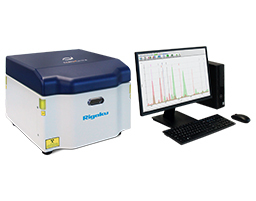 The Rigaku NEX CG EDXRF is powered by a new qualitative and quantitative analytical software, RPF-SQX, that features Rigaku Profile Fitting (RPF) technology. The software allows semi-quantitative analysis of almost all sample types without standards—and rigorous quantitative analysis with standards. Layer thickness and chemical composition of multilayer samples can be easily determined with energy dispersive X-ray fluorescence analysis (EDXRF), of thin films down to several atomic layers (less than 1nm) and up to the Âµm or even mm-range. The full Rigaku RPF-SQX fundamental parameters approach may be employed for all calculations and without the use of standards, i.e., no specific multilayer standards are required. Nevertheless any available multilayer standard can be used to optimize the results.